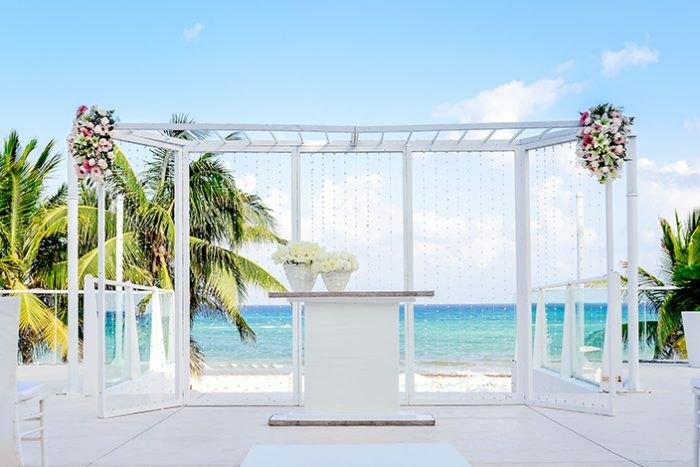 Feel the powdery perfection of the white sand under your feet as you say “I do” at one of the finest beaches in Mexico for your wedding ceremony. Take a swim in the warm Caribbean waters or in ocean-view pool right on the edge of the sand, all at this amazing all-inclusive resort. 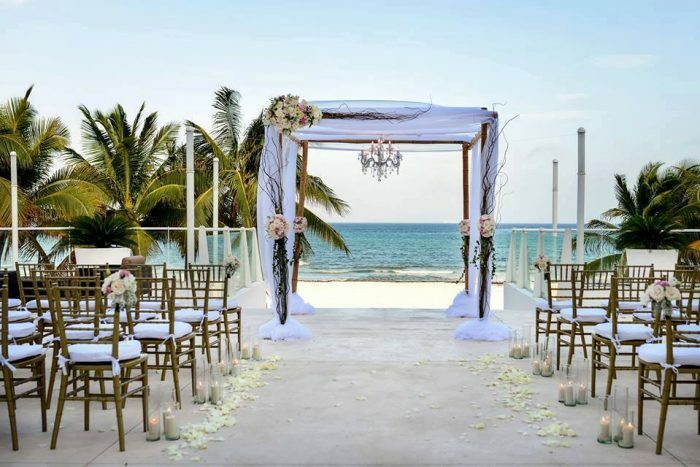 With fireworks, horse-drawn carriages, and some some of the most beautiful scenery you will ever experience, you can make your fairytale destination wedding come true at Playacar Palace. 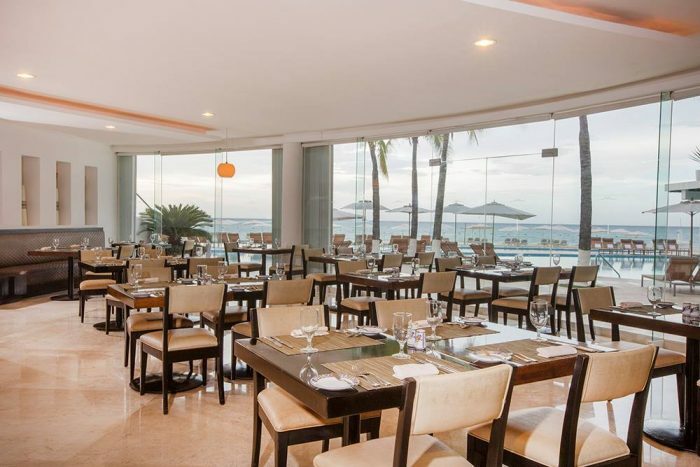 The resort is located just steps away from the famous 5th Avenue, Playa del Carmen’s Pedestrian Walkway, known for its bohemian flair and its collection of sidewalk cafes, open-air restaurants, stores, and nightclubs. The hotel is better for those who desire a quiet and more relaxed stay, as the property is a bit smaller than most and does not offer much on-site entertainment. There is only 1 main pool at this resort, so it is better for guests who love the beach. Book 10 – 19 rooms:receive free 1-hour private cocktail reception. Book 20 – 24 rooms: receive free 2-hour private function. Book 25 – 35 rooms: receive free private events for up to 9 hours, used as you see fit. North Beach – unlimited capacity, South Beach – unlimited capacity, Cielo Terrace – 120 guests max, Wedding Terrace – 40 guests max. Rooms range from $240 – $300 per person per night. Every room includes wifi, a double whirlpool tub, and a Smart TV or Apple TV with select apps. Couples looking for a romantic and intimate stay will enjoy the Honeymoon Suite with 1 king size bed, in room wine, and an exclusive beach bag. Children 3 and younger stay free. There are 201 total guest rooms, some of which have partial or full ocean views. There are also certain rooms that are oceanfront. The Sand Suite and Governor Suite rooms both include direct access to the beach from the front of the room. High-season months typically include January, May, June, July, and December. It is always encouraged to have your guests book their stay 8 – 12 months in advance. 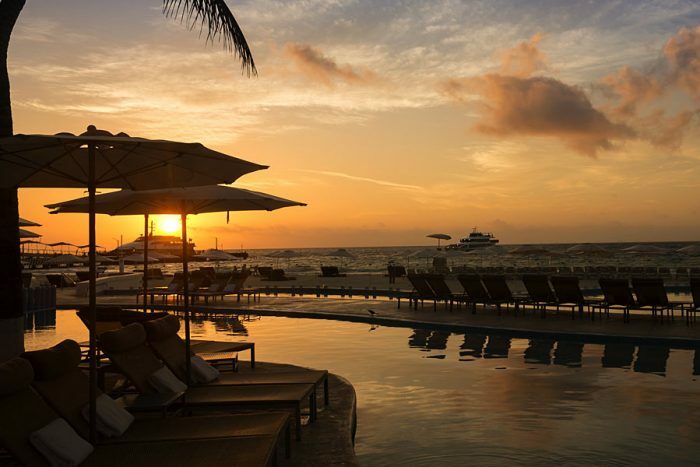 The prime location in Playa del Carmen creates a higher chance of sell out for this resort. All rooms allow up to 2 adults and 2 children max. There are adults-only rooms available with 2 adults max. All rooms will allow a maximum of 1 infant (ages 0-3) to stay in the same room with 4 guests. Children are ages 4 – 17. Playacar Palace is located about 37 miles from the CUN airport. The resort is about 10 minutes from downtown Playa del Carmen and 60 minutes outside of downtown Cancun. Playacar Palace is located 37 miles from the CUN airport. The resort is about 10 minutes from downtown Playa del Carmen and 60 minutes outside of downtown Cancun. A: I have coordinated over 500 weddings and planned over 800! 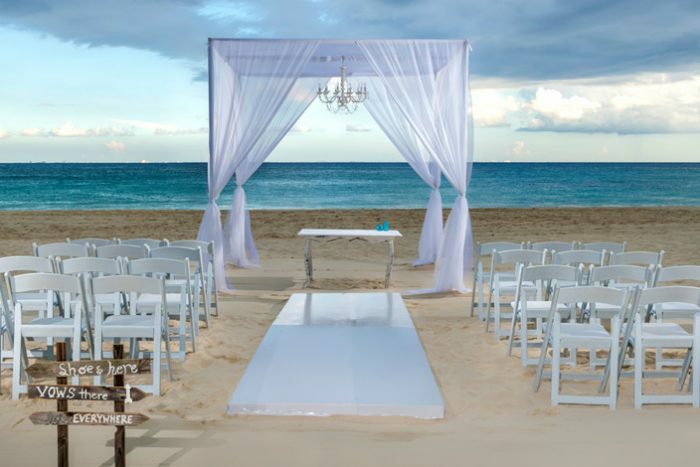 Q: What makes Playacar Palace such a great place for a destination wedding? A: Playacar Palace is one of our top resorts for weddings because it is family friendly, yet has the feel of a more intimate resort. It’s location makes it a prime spot for fun revelry due to its proximity to 5th Avenue, and the incredible white sand beaches cannot be beat. A: The serene atmosphere, but how it is also in the best location in Playa Del Carmen with amazing beaches.